Make no mistake, TripAdvisor is a booking website. It started off being only about reviews. But you just have to browse it for a few minutes these days as a customer to see that it’s encouraging you to check availability and make online bookings at every turn. How has this come about? Over the last six months or so, TripAdvisor have been busy developing software that can connect rates and availability to a vast array of booking systems and online travel agents. 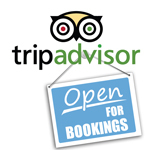 These links facilitate live rates, availability and booking on TripAdvisor itself. It’s pretty clear (to us at least) that they want every property in the world to be bookable on their website and to do this they have made the connections to as wide a variety of systems as possible. What does this mean to property owners? Well, one thing is certain: if you don’t have some way to feed your rates and availability to TripAdvisor, you will lose bookings to properties that can. You will not be included in many of the searches customers perform on TripAdvisor and this means that you, the unconnected, will lose bookings to the connected. To win, you have to make sure you are one of the connected. There is no excuse for missing out. Because TripAdvisor has connected with a massive range of booking engines, every property in the world will be able to get bookings from it. You only have to pick a system and get online. As for cost, TripAdvisor will charge on a pay-per-click basis for clicks through to whichever booking engine you’ve chosen. So don’t let any more TripAdvisor bookings slip through your fingers or leak out to the property nearby. Get connected via freetobook today. Posted in 2013, bookings, channel management, online, sales, technology, TripAdvisor, websiteTagged book on TripAdvisor, booking button on TripAdvisor, Pay per Click on TripAdvisor, show prices, TripAdvisor, TripAdvisor bookings, TripAdvisor CPC, TripAdvisor MetaSearchLeave a Comment on TripAdvisor is a Booking Website – Are You a Winner?